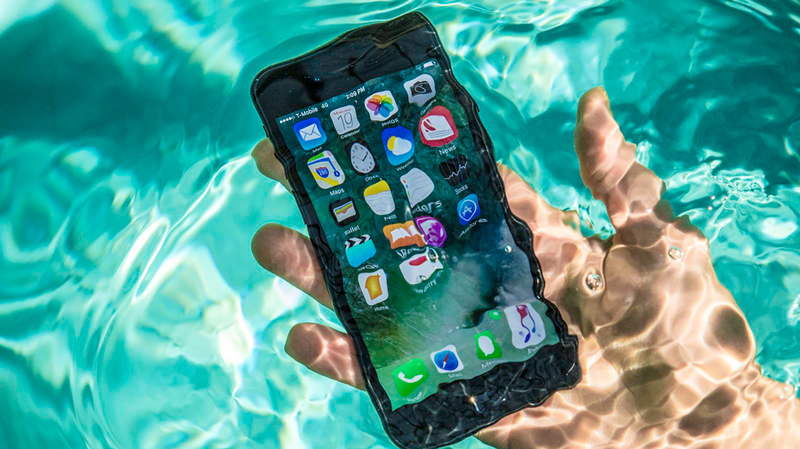 Looks like you have dropped your iPhone in the water while taking a bath, on beach or in toilet and now you are looking for some way to save your iPhone from water damage, and to find ways to recover data inside it. Well, fortunately there are few ways to rescue a waterlogged iPhone which I am going to discuss in this article in detail. According to survey water damage is the most common reason for a dead iPhone, and unfortunately it is not possible to recover data from a waterlogged iPhone because water can damage all of its data storage chips. However there are few ways which can save your iPhone from death sentence after getting it dropped in the water. We can’t guarantee that these methods will save your iPhone however these are the best strategies to minimize the water damage risk. So let’s start with strategies. After getting you iPhone dropped into the water the first thing you need to do is turn it off, and if your iPhone is already off then don’t even think about turning it on because it can cause a short circuit which will result in an instant dead iPhone. Removing sim card from your iPhone is even better. If you are an iPhone expert and willing to void its warranty then you can also go for battery removal but do it only if you are a confident iPhone pro. Now wipe the exterior liquid from your iPhone with the help of a towel or a soft cloth. Also try to enter the cloth with toothpick or pencil in iPhone ports to make them dry too. Give it a gentle shake to clear the water inside it. Using hair dryer or an air blower can be a very effective way to dry water from an iPhone or any other electronic device. It is also easily available at home so you can use it instantly after getting your iPhone water damaged. Hair dryer works perfectly to dry your iPhone but it needs extra care while using it as it can also cause heat damage to your device. Overheating your iPhone can easily damage circuit so be extra careful while doing this. It is recommended to use hair dryer from one to two feet distance and use it in different time intervals. Each interval should not be more than 30 seconds. You can blow air in iPhone ports to dry water inside the iPhone. Rice is a good natural humidity absorber and can be used to absorb water from your soaked iPhone. To do so, keep your iPhone in a deep bowl and fill the bowl with uncooked rice. Don’t forget to cover iPhone ports with a tape because rice grains can also enter into the ports easily. Keep the rice buried iPhone near window or at any outdoor place where air flow is good. Leave it for at least 48 hours before you check it again. It is a very effective way to dry moisture inside your iPhone however your iPhone may get dust by doing this. A better option than rice to absorb moisture from your iPhone is silica gel. It is a very effective moisture absorber which comes with electronic components, medicines and leather products. Companies keep silica get packets in their products to keep them safe from humidity. You can use these silica gel packets to rescue your soaked iPhone. To use it, you can put your iPhone in an airtight plastic bag with few silica gel packets and leave it for 48 hours. Silica gel packets are more efficient than rice so it is better to use these instead of rice technique if it is available at your home. You can also buy silica gel packets from a shopping mart or a book store. Another way to recue your wet iPhone is using EVAP pouch. It is a product available in the market which is especially designed to absorb moisture from any electronic device. This pouch also uses silica gel to do so however the main feature which comes with this pouch is the humidity indicator. The indicator shows the level of humidity inside the pouch. So, when you put the soaked iPhone in this pouch you can actually monitor the humidity level which helps to analyze that if your phone is completely moisture free or not. The indicator turns white when it absorbs all the moisture from your phone. EVAP rescue pouch is available on the internet or in different mobile shops for few dollars only. It is better to keep this product at home in order to tackle with any uncertain incident of phone or other gadget damaged with water. Get EVAP Rescue Pouch here. If upper defined ways of reviving your iPhone from water don’t appeal you then upgrading to iPhone 7 can be the best option. The new upcoming iPhone 7 and 7 plus are designed to be waterproof which means that iPhone 7 and 7 plus can survive in up to 1m deep water for 30 minutes. This feature can ensure your iPhone safety from water damage. Is iOS7 Really Water Resistant? I hope that the upper defined ways will help you in reviving your soaked phone. If you have just repaired your iPhone from water damage by any of upper defined ways then it is time to take actions to avoid such incidents in future. There are many accessories which you can use to save your iPhone from getting damaged by liquids. The most popular accessory people use with their iPhone to make it waterproof is using water resistant iPhone cases. There are many water proof cases available in the market in different styles and designs. Covering your iPhone by such cases will surely add extra safety to your iPhone. Using wrist straps is also a considerable option to save your iPhone from dropping it in water.